Anybody who knows me knows that I am a massive fan of contouring. If I am wearing any kind of makeup, you can guarantee that I am going to be contouring. At this stage, if I don’t wear any contour I literally feel like a blob with a head the size of a beach ball. Funny, how I never felt like that before I started contouring, it is a slippery slope guys. Anyway, in this post I thought I would shade with you my favourite and most used contouring products. On the daily for work or just a minimal makeup look, I will go in with just a normal powder contour. But, if I have an occasion where I want to look a little extra and I want to look completely polished and perfected I will go in with liquid or crème contouring. I just feel that when I do that extra step it just really finishes my makeup and makes it look more professionally put together than when I just go in with a powder. I don’t really know what it was that possessed me and made me buy this foundation stick in a contouring shade, but I am so glad that I did. After I have finished my foundation and concealer, I will go in with this stick and just add a few lines here and there on my forehead, cheekbones and jawline and then blend it out. The good thing about this foundation stick is that it is really creamy and full coverage so your makeup stays put and doesn’t budge. This foundation just has such a nice formula to it and it is just really nice to use, I am surprised that it isn’t used by more people! I first started using this probably 3 or so years ago and I still love it just as much as I did back then. I like to use this to contour the face around the outer parameter and then I blend it either with my Beauty Blender or with a MAC 130 brush. I have never had any issues with this concealer for contouring. It just blends out really nice and easily and it looks so pretty and flawless son the skin. It just gives a warmth to the face that just isn’t there when I go in with powder contouring alone. I was so dubious about this product before I bought it. I had seen so many people using it on YouTube and it had been featured in so many blog posts, but I just couldn’t see how it could work on me. I have quite deep olive skin and the medium tone which everybody else seemed to be using just didn’t look like it would work for me. So, I got the deep shade and I am in love with it. This blends out so seamlessly and even though it is a deep colour, it still has that ashy undertone that makes the medium shade so perfect. This just really looks like a very natural shadow on the face when it is applied in the correct way. I have used this to contour with for as long as I can remember. I placed my first order from MAC when I was about 15 and I bought this back then and I have been using it ever since. At first I admit that I did get this just because I ordered the wrong shade. Back then the MAC website was a mess and I clicked to get NC40 and ended up with NW58 because the scroller on their site didn’t work. But, I made the shade work and even now it is the most perfect contouring shade for my colouring. I am obsessed with this. 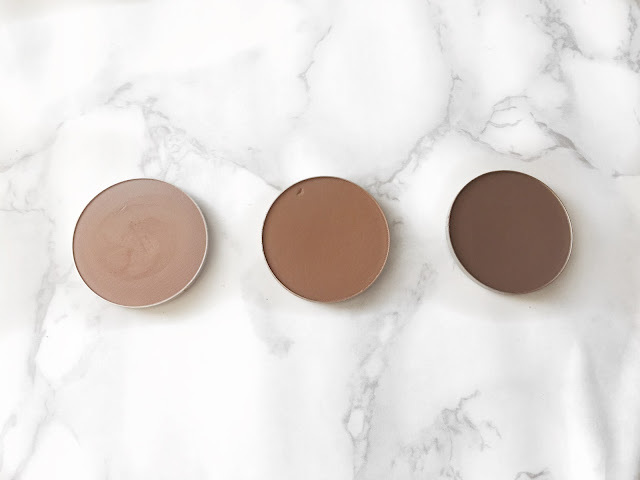 The good thing about this is because it is a full coverage powder, even if it displaces some of the makeup underneath it will keep your coverage. I have been using these sculpting powders for the longest time and I feel like I am the only person who uses them. In all of my time blogging I don’t think I have seen anybody else. I created my own MAC pro palette with three contouring shades and three highlighting shades. 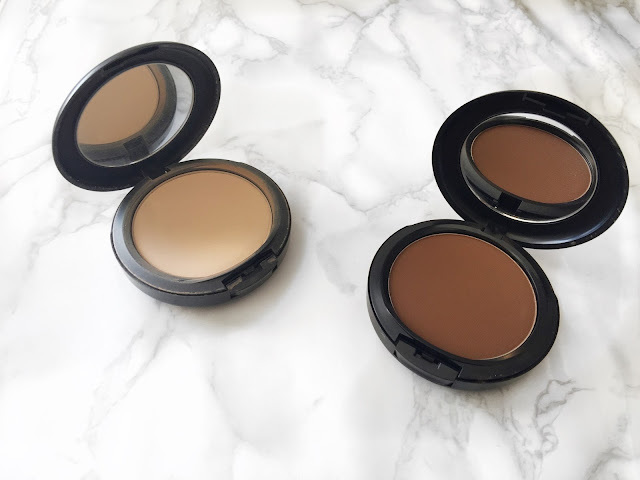 Two of the contouring shades I use every day because they work so well together. They are the shades Shadowy and Shadester. One is a warmer shade and the other tone is a cool tone. The two mixed together are just the perfect shade for my skin tone. I like to use these with my Real Techniques Blush Brush and it just looks so flawless on the skin. I have been using these for years now and I have no sign of stopping! There you go, my contouring favourites. These are the things that I will reach for on a daily basis. In the next few months I want to branch out and try some new things because I have become quite set in my ways with the products that I use. I know one thing that is certainly on my list to try is the Hourglass Vanish Foundation stick in a deeper shade, it is such a nice and creamy foundation so I bet it would be good for contouring with! I will leave links down below to the products that I have mentioned, in case you want to check them out. Make sure you leave me a comment down below and let me know what your most used contouring products are and I will check them out! It is an amazing product, I reach for it all the time! I really want to give a go to contour sticks ! Thank you for the recommendations ! I love contouring sticks, I use them all the time! I wish I had a naturally sculpted face, without these things I feel like a potato! I really like the LA Girl Pro Conceal for contouring, its such a fab concealer. I use a light one for under my eyes too. I have a lighter one and I tried to use it under my eyes to highlight but I found it broke up quite a bit around my nose, probably because I have oily skin. But for contouring with, I love it! I've never used a darker foundation to contour, but that foundation stick seems like it would work really well! It just keeps your coverage in place and blends it out really easily! I love the idea of using a foundation to contour with as mine never seems to last all night so this might give it a bit more longevity! It is just so much creamier and so easy to blend!